Megan Morrison couldn't see the forest for the trees on The Arrangement Season 2 Episode 10. She might have escaped Terence's death grip with some surprise help from DeAnn, but she really screwed up with Kyle. I'm not totally convinced that Megan will be in control of her life despite so much turning out in her favor. And if you analyze everything that happened on this sort of meh season finale, she didn't accomplish anything she set out to at the end of The Arrangement Season 1. I was sort of hoping that DeAnn and Megan would team up to kill Terence, but that was too lofty of a wish -- at least for this season finale. 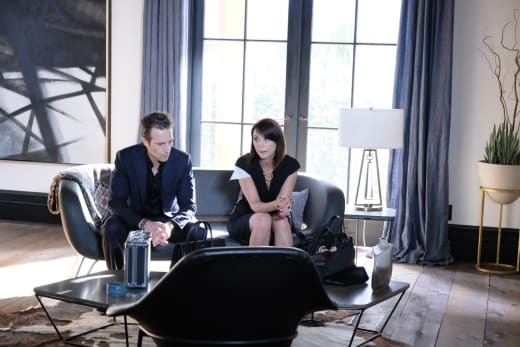 If The Arrangement gets renewed for a third season, I'd love to see the two of them, along with Leslie, work together to bring IHM and Terence down. It would present a lot of challenges considering that Shaun -- as I rightfully guessed -- is now on the devil's side. 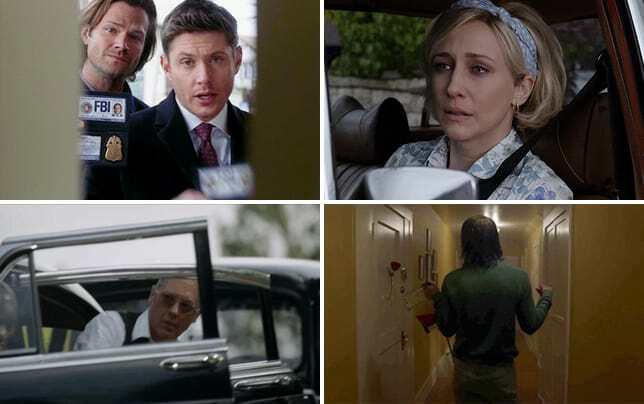 Related: Renewal Scorecard 2018-19: What's Coming Back? And then there's the issue of Kyle who is beyond pissed off at Megan's betrayal. For him to go to Iris and tell her and the world (when the interview airs) that he lied about everything was completely unexpected. He wanted to show Megan that he did love her despite what she thought. He put his career on the line for her only to find out that she betrayed him. She had no right to try to explain away what she did. It was stupid of her to have spent the night with Xavier the night before her wedding. She acted without knowing all the facts. It's maddening because she was so blind to the fact that it was Shaun all along. How was she so stupid that she couldn't see Shaun for who she really was always boggled my mind. Did she think she would have gotten away with her little fling? I'm just surprised that it was Iris who revealed that juicy piece of information. The real question is why didn't she take that to the tabloids or TMZ. Why was she holding on to it? And why share it with Kyle? For Megan to have acted like she didn't know what Kyle was talking about when he asked her about her night with Xavier was extremely stupid on her part. And for her to get mouthy when he dictated what she'd be doing with her life now that she broke the contract was pretty ballsy. Kyle gave her an opportunity to leave, and she chose not to because being with Kyle gave her everything she could ever want. She's got fortune and fame and all so why should she have walked away? Megan isn't true to anyone. She showed her true colors when she turned down that offer. She was never in love with Kyle no matter what she might have tried to tell herself. It was always about her career and how to further it. She doesn't care about anyone but herself, and if she thinks she does, then she's lying to herself. I hate to say it, but there's nothing redeeming about Megan Morrison. I had more respect for Kyle after this episode than I did for Megan. She can get her back up all she wants, but Kyle holds the cards now, and it's pretty clear he's done taking direction from anyone, including Terence. Kyle has had an enlightening season -- and that's to Megan's credit. She worked hard to try to get Kyle out of his IHM trance, and he was starting to see through the fog. He's not about to let Megan get away with what she did. If his career is going to suffer, then so will hers. If he has to turn to Terence to make it so, he will. She and DeAnn might have the goods on Terence, but it won't prevent Terence from protecting his finest asset. At least until he molds Wes the way he wants. I would imagine Terence and DeAnn's marriage is over. He seemed pretty committed to Shaun, and it wouldn't be surprising if they ended up getting married and running IHM together. That's the vibe I got. DeAnn deserves a lot of credit for standing up to Terence. She played the game very well between Terence and Megan, and it wasn't clear whose side she was on. There were some pretty tense moments in that hotel room. Terence got duped by his wife, and it was a great moment when it finally dawned on him exactly what she did. It probably never occurred to him that he doesn't have as much control as he thought he did despite all those happy, smiling faces staring up at him as he was talking about that whacked out life extension thing. The Arrangement Season 2 was a fairly enjoyable ride. Kyle and Megan's story is far from over, and I'd love to see where it goes from here. Besides, doesn't everyone want to see the destruction of IHM and Terence as much as I do? If DeAnn was willing to go this far to stop Terence, imagine what she'd be capable of with a little help from Megan and Leslie? 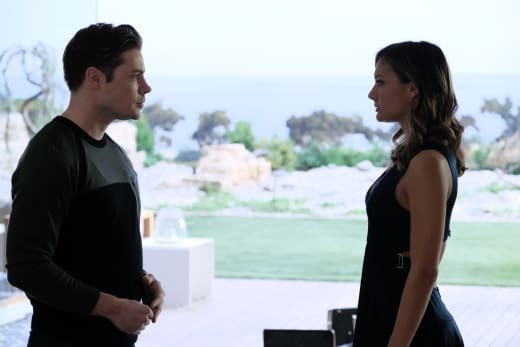 What did you think of the season finale of The Arrangement? Were you surprised that DeAnn turned on Terence? Will Kyle and Megan ever reconcile? Do you want to see a Season 3? 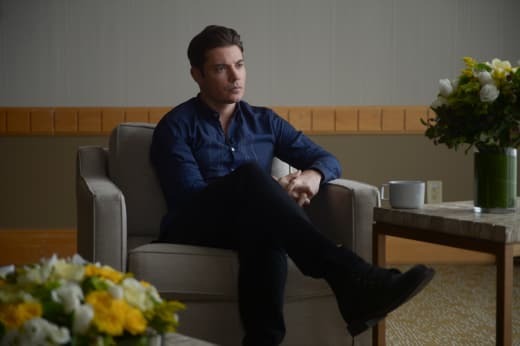 If you need to catch up, you can watch The Arrangement online via TV Fanatic!